Data is on overdrive. It’s being generated at break-neck pace, flooding out of the dozens of connected devices we use every day, and it shows no signs of slowing down. In fact, the number of internet users has grown over a billion in the last five years, more than half of the world’s web traffic now comes from mobile phones. 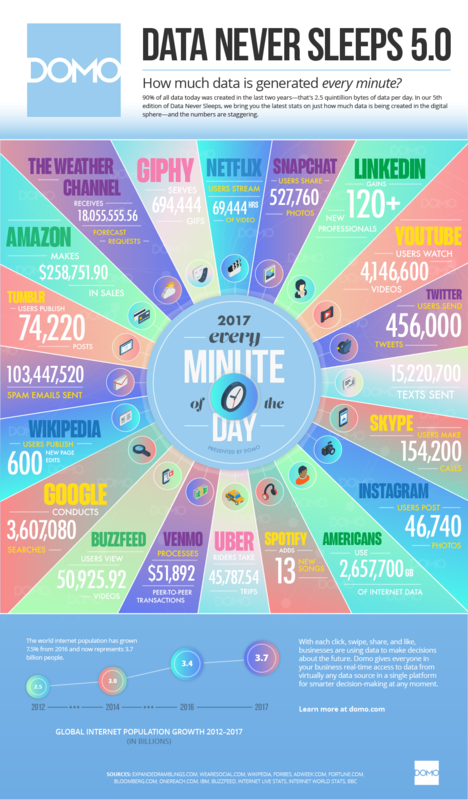 In its fifth year, Data Never Sleeps shows exactly how much data is created every single minute. From tweets to swipes, likes to shares, the digital world is exploding. Have a look.